I’m sure you know where where this post is going … NUTS! So, if you are NOT a nut lover, my apologies, you can delete this email, keep blog-hopping or go back to Facebook work. Nuts. I’m not 100% sure when the love affair began I do know that we had peanut butter toast (Jiff crunch to be exact) on all our vacations – pre-hiking or pre-skiing, down by the beach or boating in the middle of the lake. Surprisingly I don’t think my mom packed me PB&J too often (yes, she was a doll and made my lunches) but I do recall pb + tortilla (and often chocolate chips) being my go-to after school snack. So healthy, I know. ^^ happiness. the first scoop of any jar. One thing led to another and I started to realize how many varieties of nut butters were out there! 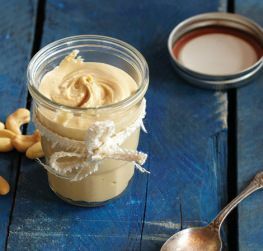 Sunflower seed butter, almond butter, cashew butter, coconut butter, and pretty much any epic combination you could dream up. I’m currently in the almond state of mind – almonds in my oats, almond butter in my fridge, and I’ve even got my eyes on some dark chocolate almonds for this weekend. Where could you go wrong? ^^ My friend Marnie is an avid nut butter creator and makes THE.BEST.COMBINATIONS ever. She even made me my own special mix (cashew butter w/ Baileys) for my birthday. The jar (like many other jars) was finished in record time. ^^ One of my favorites of all time. Or all of the one time I purchased the $12.99 jar. Definitely a flavor I want to test out! But, my true love is for sweets, so thank goodness there are endless ways to enjoy almonds – either on their own or mixed into my favorite recipes (more recipes with almonds to come soon-ish). Just don’t drool too much. 4) Can be eaten at any point of the day – breakfast (smoothies, almond butter toast, almond granola), lunch (salads, thrown into wraps or sandwiches), dinner (topped on chicken or fish or veggies), snack time, and dessert! Almonds for the win my friends! This entry was posted in Being Creative and Crafty and tagged almonds, health, nuts by Kaitlin. Bookmark the permalink. Whoa that last combo sounds divine! I must try that! !